This last weekend, as LGBTQ Lutheran pastors, seminarians and candidates met for our annual Proclaim retreat, we talked about the words we have used throughout our history to describe our work. Behold, I am doing a new thing! was the phrase that rang out during the first extraordinary ordinations of openly gay and lesbian people in January of 1990. When people asked by whose authority these pastors were ordained, we talked about borrowing our authority from the future. And when asked for the theological framework for the ordinations, we turned to Martin Luther’s writing about irregular ordinations in instances where bishops were acting contrary to the Gospel. As a community of LGBTQ pastors operating in an extraordinary fashion came together, this group talked about being a community of resistance that was in principled non-compliance to an unjust policy requiring celibacy for gay and lesbian pastors. As we realized that change may be a long time coming, we shifted our focus from changing the policy to making ministry happen now. 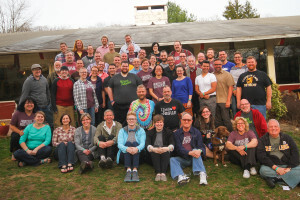 As we moved into the early days following the 2009 policy change, we spoke of changing the church through the ministry of publicly-identified LGBTQ pastors and rostered leaders. We affirmed these faithful and fabulous leaders – faithful in their call and fabulous in their LGBTQ identity. Proclaim member Cary Bass-Deschenes and his husband, Michael. Photo by Emily Ann Garcia. 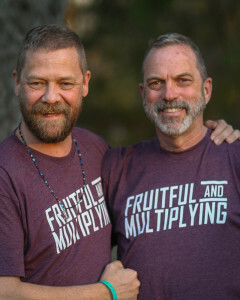 Now we find new words: Extraordinary Lutheran Ministries is FRUITFUL AND MULTIPLYING. Not only are the numbers of Proclaim leaders growing, but LGBTQ-led ministries are multiplying – into new corners and wide spaces in the church and world. Those who are invested in and committed to celebrating the gifts of LGBTQ people in ministry are multiplying. When we nourish LGBTQ leaders, they bear fruit – which gives life to a world that craves it. Fruit is rich, delicious, nourishing, and colorful. And we are joyful and playful and ready to follow a God who turns the world on end. At the end of our weekend, we invited each person to share a word, phrase, or image that they were left with after our time together: Gratitude. Possibility. Rich. Blessing. Proclaim. Friendship. Healing. Finally! Solidarity. Moved. Space. Beloved. History. Called. Family. Grace-equipped. Fruitful. Multiplying. Next week – more stories and pictures from the 2015 Proclaim Retreat! This entry was posted on Thursday, April 23rd, 2015 at 10:32 am	and is filed under Blog. You can follow any responses to this entry through the RSS 2.0 feed. Both comments and pings are currently closed.